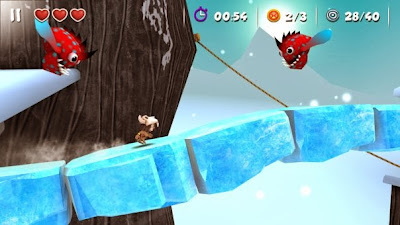 Manuganu, a 3D side-scroller running game, where you control the boy "Manuganu", and Kiwi Wonder comes to BlackBerry 10 phones. You can download these games on the BlackBerry World, priced at $0.99 (USD). Manuganu works with BlackBerry OS 10.0.0 or higher phones while the Kiwi Wonder works with BlackBerry OS 10.1.0 or higher phones. Manuganu for BlackBerry 10, unlike other usual running games, brings on the "Halt feature" to avoid swinging rocks, hammers, flames and other enemies with the right timing. Another important feature of Manuganu is the ability to switch from "RUNNING" mode to "ROPE CLIMBING" mode when needed. Everyone has a dream, and for this particular Kiwi, it is to fly like all the other birds. With a little help from Mily the Dream Pixie his wish is fulfilled when she shows him the way to Wonderland. Dream the dream and fly! 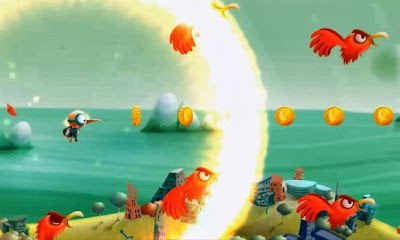 Challenge your friends and get the ultimate high-score in this challenging action game. Soar through surrealistic landscapes, avoid the mean birds or stomp them on their snickering faces and collect as many coins as you can before you wake up!